Update: I've added a few tidbits at the end. Anthony Watts of WUWT is in serious trouble now. He can't get away from it. John Cook and the good people at SkepticalScience.com have got him on the back foot. He's squealing and squirming and has resorted to telling lies. @wattsupwiththat dude, you have seriously lost it. ...When you take a result of 32.6% of all papers that accept AGW, ignoring the 66% that don’t, and twist that into 97%, excluding any mention of that original value in your media reports, there’s nothing else to call it – a lie of presidential proportions. 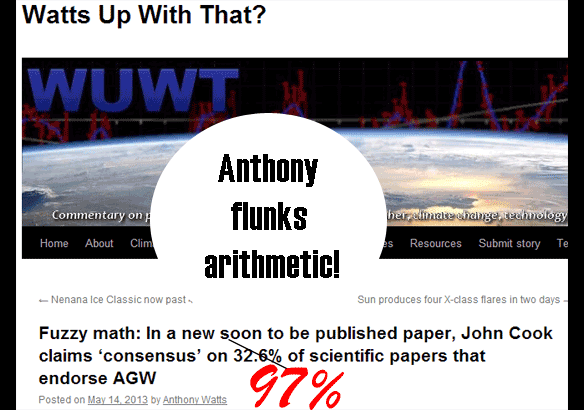 Anthony wrote that 66% of scientific papers don't accept AGW. That's a Whopper of a Lie! This study done by John Cook and his “team” found more scientific publications whose abstracts reject global warming than say humans are primarily to blame for it. The fact is that 97% of scientific papers that take a position on the cause of warming attribute the cause to humans. Cook et al (2013) classified 11,944 papers. Of those, 4,014 expressed a position on global warming. 3,896 of these or 97.1% attributed the cause to humans. What Anthony has done is added the 78 papers that dispute this fact to the 40 that aren't certain to the 7,930 that took no position on current anthropogenic climate change. That's right! Anthony added a whopping 7,970 to the mere 78 papers that dispute global warming - to try to fool his readers. The papers that took no position included papers about past climate (where today's warming is not relevant), papers on mitigation and lots of other subjects relating to climate change. They did not dispute that humans are causing global warming. The fact that Anthony has to lie is a big tell. He is on the back foot. He doesn't know what to do, so he resorts to telling big fat lies. You can classify the abstracts that were the subject of Cook et al at SkepticalScience. You'll even get to compare your ratings with those of the study itself. Spread the word, visit The Consensus Project. May 17, 2013 at 11:40 am: ...I challenge any blog pro/con for AGW to match our track record for allowing adverse comments and comment volume. Don't know about volume, but then quality outranks quantity every time. Anyway, here's a couple or more: Deltoid, RealClimate - with the real bad ones here, and then there's WatchingtheDeniers. And another one from Anthony. To explain the context, Anthony has a headline that denies the fact, it reads: The 97% consensus – a lie of epic proportions. Anthony's whole post is predicated on a lie yet he gets all upset that Washington post didn't correct their too obviously wrong story? May 17, 2013 at 11:35 am Ummm, that 31 million followers figure is what @BarackObama has and I think someone misread how that figure was used. It was supposed to be something like, 31million is good exposure, meaning BO brought the info to that many people. Well, Anthony, a number of your readers have corrected your lie. Not only have you failed to correct it, you've repeated it. May 17, 2013 at 10:44 am If that number was true, 97% of scientists have not done their homework and need to be sent to bed without dinner. May 17, 2013 at 10:23 am Is Obama really that thick, or does he have an ulterior motive? Had to contend with an emeritus biochemist, the wellknown http://www.desmogblog.com/arthur-rorsch , who was not thát brutal. He 'observed' that the 66% abstracts expressing no position imply the scientists 'lost interest in AGW altogether'. 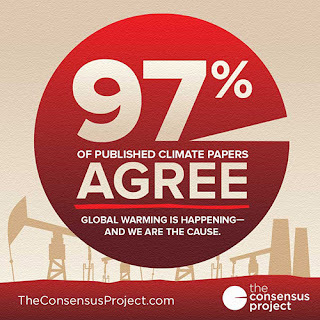 Since Watts himself accepts the theory of AGW, it would be surprising if he thought that 66% of published papers on the subject did not accept it. I assume he simply phrased his argument badly ? I'd also assume that Sou realises this, but the Bitter ol' Biddy of Bundanga is not one to miss an opportunity to have a swipe at anyone she feels may have pissed on one of her trolling parades in the past. Exactly. which is why I say he told (repeatedly) a whopper of a lie. Today he's being equally silly by arguing that higher sea level doesn't mean that a lesser storm and accompanying storm surge can't do the same damage as fiercer storms in the past. If you read WUWT regularly, you'd see that Anthony has posted lots of articles telling fibs about Cook13. Not just his own, but articles by Christopher Monckton too. Perhaps you are arguing that Anthony didn't mean to write what he wrote and wrote again. If he didn't mean what he wrote then why would he have written it? Is he stupid or is he a liar? It's got to be one or the other or both. Moved to the HotWhoppery - Sou. So then they both lied.